So how are we doing when it comes to participation of crisis-affected people in decision making processes that affect their lives? “Participation is a buzzword. If it doesn’t match the authentic philosophy of the organization, it becomes a smoke-screen.” This was an observation made by a fellow participant at the ALNAP Annual meeting in Addis Ababa in March 2014. It’s been 4 years since that insightful meeting which focused entirely on engaging crisis-affected people and 2 years since the World Humanitarian Summit where the signatories of the Grand Bargain committed to “leave no one behind” and to engender: “a participation revolution: include people receiving aid in making the decisions which affect their lives…and to create an environment of greater trust, transparency and accountability.” (The Agenda for Humanity, 2016). Sadly, the statement from 2014 most accurately describes the current reality. We haven’t lived up to the aspirational principles of participatory and inclusive decision-making. Despite this fact, I am filled with hope today because there are promising signs. The commitment to shift the status quo on participation has been steadily growing, not the least because the power dynamics in the aid sector is no longer an undiscussable topic. Power, legitimacy, decisions and behaviors of aid organizations are scrutinized and challenged by more actors than ever before. I am also hopeful because in my advisory work at CDA, I’ve been privileged to work with leaders and champions in partner organizations that have made conscious efforts to boost their competency to lead, manage and coordinate relationally, by engaging and facilitating a diverse set of stakeholders in decision-making and inclusive governance. But the question remains: what does a broader assessment of the sector show on this perennial question of participation? those who live with and through crises should be at the center of humanitarian action; they have a right to dignity – to be treated with respect and to have a say in the decisions which affect their lives. enabling crisis-affected people to play an active role in the decision-making processes that affect them. It is achieved through the establishment of clear guidelines and practices to engage them appropriately and ensure that the most marginalized and worst affected are represented and have influence. have tried to fulfil the commitment to participation of affected people by creating frameworks, standards, guidelines, training programmes, case studies, and learning documents to improve policies and practices. Projects, resources and staff have been dedicated to improving communications, community engagement and feedback from, and accountability to, people affected by crises, particularly international and local organisations, and some UN agencies and donors. Working groups, common platforms and coordinators have been established at the country level in many recent humanitarian responses to improve communication and enable greater participation. (HAR, p. 28 and Grand Bargain Annual Independent Report, ODI, 2018). To interpret the cumulative impact of these efforts, we applied a maturity assessment which analyzes the following elements: 1) movement/buy in, which shows how far people have accepted the need for, and are willing to participate in, change; 2) direction, which shows how much change has actually taken place in thinking and practice as measured by indicators, including definitions of concepts, commitments and objectives; concrete actions taken and the assessment and measurement of progress; and 3) environment, which shows enabling and dis-enabling factors for change such as: funding, cultural norms or organisational behaviors; partnership agreements, grant conditionality; tech developments; and policy and legislative enablers and constraints. (HAR, 2018, p. 15). The table below presents our assessment using a 4-point scale (HAR, p. 29). 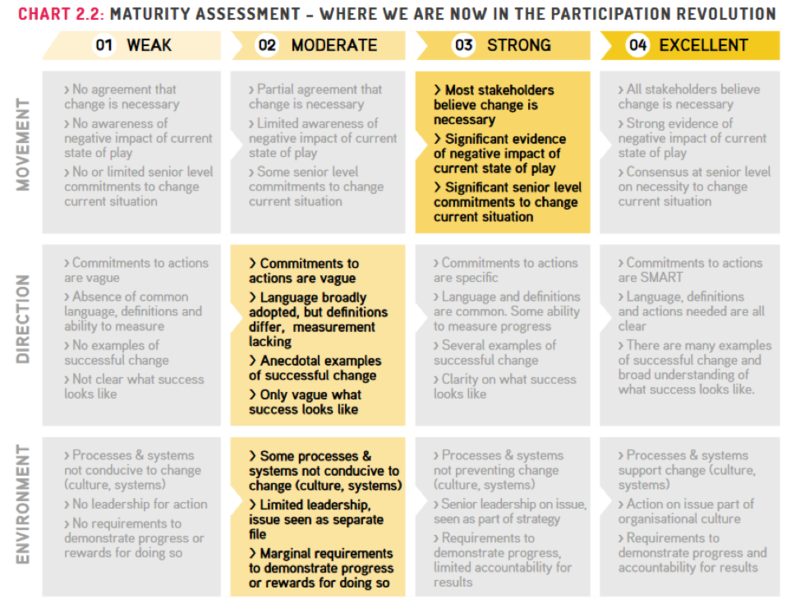 The SCHR’s 2017 Peer Review on Participation offers the above “participation continuum” which aspires to shared control and decision-making at the farthest end of the continuum. During CDA’s Listening Project, we heard many people describe how aid providers drive decision-making and how local communities are “consulted” on decisions that have already been made. People expected greater respect and engagement between providers of aid and recipients, instead they saw increasing distrust and disrespect. While aid recipients often expressed a desire for “a seat at the table” and a genuine surprise that they’ve seen little transparency and accountability over time, they also recognized that accountability and participation is a two-way street. Recipients have a responsibility to express themselves and to engage in joint analysis and decisions in order to advocate for inclusion of marginalized voices and to generate informed options jointly. For CDA, joint analysis and options generation is the cornerstone of the Do No Harm Framework. The report also points to an opaque understanding of how decisions are made within humanitarian organisations, UN agencies and donors, and coordination structures. As noted in the Bond/CDA paper on barriers to better feedback loops, “what is clear from field-based case studies is that the decision-making process is rarely transparent to the frontline staff, let alone local communities and stakeholders.” (Beneficiary Feedback: How we enable and hinder good practice, Jean, 2017). This lack of transparency makes it difficult for staff and partners to know how to support the participation of crisis-affected people and local organisations. Knowing how decisions are made is not just a challenge within international organisations, but also in local and national institutions and organisations that may be even less inclusive and transparent. For participation to be meaningful and respectful, we ought to resist “proceduralizing” it (Time to Listen, Chapter 6 on Proceduralization). As we point out in CDA’s Time to Listen book, organizational procedures, rigid “protocols” and bureaucratic measures often displace established, trusted and meaningful processes and mechanisms that people are already using. Community members and staff often describe processes that feel overly “engineered.” As one colleague once said, “Our proces should be a handrail, not a straitjacket.” When we aspire to meaningful participation and consultation with communities, under whose terms are these processes being designed and implemented? Organizations CDA has advised in recent years have started to seek feedback on the process itself instead of using a pre-determined and rigid process to extract feedback on pre-selected topics. Our case studies show that effective participation at all stages is preventative as it de-escalated tensions and improves trust. Ultimately, the quality of the process matters. Local community members have repeatedly said that they are more willing to forgive the WHAT (missed deliveries, wrong support, etc.) than the HOW (decision-makers dismissing feedback, being unresponsive, disrespectful group facilitation, etc). If we agree that empowerment does not simply mean handing over power, and that it is a process of facilitation that allows people to empower themselves, then we ought to ask – are aid workers selected for their community engagement and facilitation skills? Are they trained and prepared to facilitate processes that are dynamic, nuanced in terms of social structures and power, and contentious? After all, crisis often erodes communal structures and dismantles existing leadership structures and established processes. We often assume that we can engender meaningful and effective participation in a disrupted context and in the upheaval that follows the crisis. This is by no means easy to do. What will it take to do this better, and when to get out of the way, should be a central question for us as we take the assessments and lessons presented in the 2018 Humanitarian Accountability Report into our work. CDA, CHS Alliance and Oxfam America will be holding a discussion of the HAR 2018 on Friday, December 7 at Noon at Oxfam America office in Boston. Please join us if you can! Isabella Jean is Director at CDA with oversight over collaborative learning processes and aid effectiveness practice area. Her learning and advisory work focuses on conflict-sensitivity, peacebuilding effectiveness, design, monitoring and evaluation and accountability to communities and feedback loops. Isabella has led collaborative learning efforts and field research in Africa, Asia, the Caucasus and the Middle East. In 2012, she co-authored CDA’s book, Time to Listen: Hearing People on the Receiving End of Aid.